So no Lucky You for lucky me. The song itself is perfectly fine. It’s certainly no “Things Have Changed”, but it recalls the type of contributions that Dylan had more recently made to Gods and Generals and to North Country. It’s a nice ballad, with some nice slide guitar, but it doesn’t really have a chorus or a hook, and so it is not entirely memorable. PS. 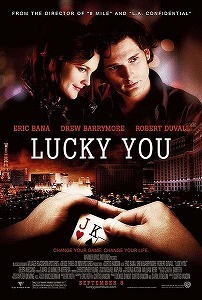 I guarantee that Lucky You ends with Eric Bana getting rivered to finish second in a huge poker tournament, but that’s ok with him because he wins the love of a good woman and restores his relationship with his dad, which is all that matters. What do I win if that’s correct?